The company I worked for, Lucent, started the satellite radio program about 1998. I was hired to run the program in January 2001. A tremendous amount of systems engineering was done by then. Unfortunately, there were myriad of implementation hurdles to be resolved. 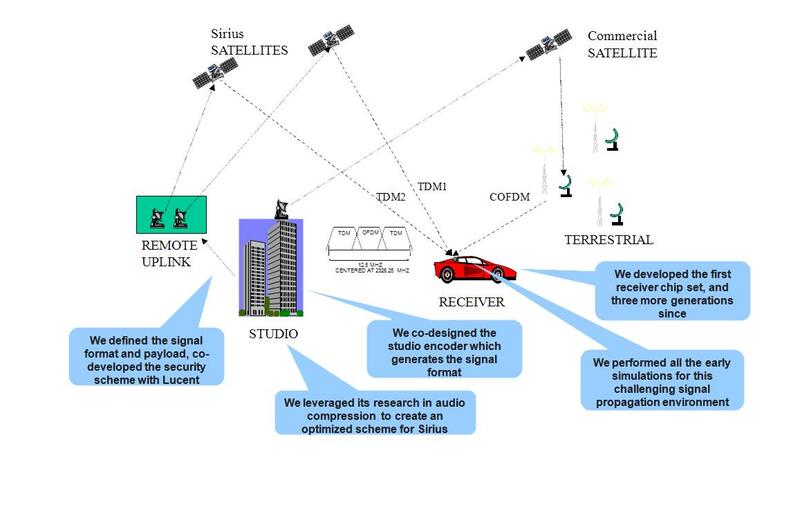 The Satellite System used two satellites in orbit at the same time, with a third signal coming from terrestrial repeaters. The three signals were combined together to reduce the effect of errors on one particular signal. The signals were also time shifted so that the effect of a tree or an overpass on the highway would not affect signals at the same time. This is a technique called time diversity. The end goal of the sytem, of course, was to provide 96% audio continuity to the listener in the car. Eventually, everyone realized that 99.9% is the number people who pay every month would tolerate, and the system as well as the chip had to be improved to provide this reliability. Our team did the initial systems design, the studio signal compressor, some of the uplink systems, the receiver design, the receiver reference designs, the chip implementation and the test systems necessary to field the units, and test them in the factory. This effort was basically a turnkey receiver and studio encoder. A team of people worked on the security scheme, the specifics of which remain a closely guarded secret. Here is a picture of the overall system, and the involvement that my team had in all the aspects. The system was a state of the art wireless system at the time of its design. The complexity of the implementation was above most of the commercial wireless systems found at the time. This was both a blessing and a curse. It was easy to attract very qualified engineers to work on the effort, but the delivery of such a complex plan was always a stressful effort. Despite the challenge, the team loved the work, and we all recognized it as one of the most challenging and fun technical efforts in our careers. The business situation was equally challenging, but can't really be discussed. Nevertheless, we always made money and were able to meet the objectives over the years. In the eight years since the availability of the first receiver chip set, the size, power consumption and the component count for the total receiver solution decreased significantly. This business had moderate volume and a low potential to see exponential growth as seen in categories such as cell phones. Nevertheless, there was a need to shrink the solution to follow the same technology trends as other consumer electronics solutions which the subscribers expected. In addition to the improvements on the signal quality, this technology curve meant: 1) reducing the component count by System on Chip Integration (SOIC); 2) Reducing the cost using the leading edge (not bleeding edge) technologies for chip integration 3) Changing the features in the chip to support new capabilities, and 3) changing the architecture of the receiver to single conversion or homodyne receiver to reduce the cost of external components. Disclaimer: I believe all the information on this site to be either public, or observable by looking at publicly available material, or to have been shared with other parties in the course of business under non disclosure agreements which have long expired at the time of the publication of this website.. Please contact me for any non-compliance with the previous statement. The html code in this site is property of author and under copyright. While all attempts are made to present only factual information, this site contains the opinions of the author and is not in anyway endorsed by his previous employer(s) or Sirius XM. The purpose of this site is informational; to demonstrate the efforts that can be achieved by a good engineering team, represent an accurate view of the history of such a project, and allow the reader to learn from this history which may parallel other technical and business development. Honest attempts were made to delete corporate logos and trademark if such are not placed on published information such as boards, receivers, or other materials. Please contact me if any violations require remedy.